The concept of cooking a grain or a starch and flavoring it like a salad isn’t new to me. 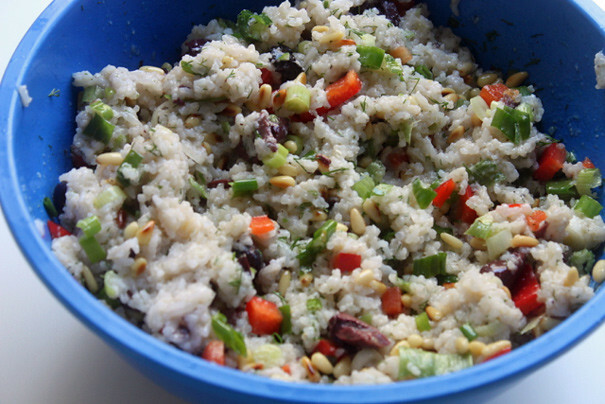 See my past experiences with quinoa, wheatberries, farro. Here, the star of the show is rice and you have to cook it right so it’s fluffy and firm and can hold up to the dressing. For some reason, despite following the recipe directions, my rice–long grain rice–came out super sticky and almost mushy. Theory: I had the heat too high during the cooking process and overdid it. At this point, I had a friend coming over for dinner and didn’t have time–or the energy, really–to cook another batch of rice, so I used it despite the mushy/sticky qualities. Step one: add a dressing made with olive oil and vinegar. 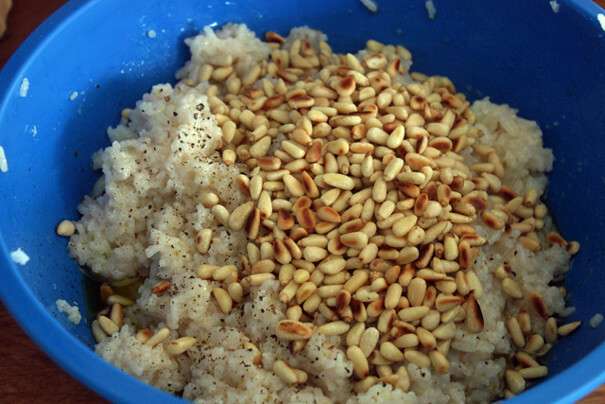 Step two: add toasted pine nuts. Then lots of good stuff: olives, scallions, red pepper, parsley, and dill. 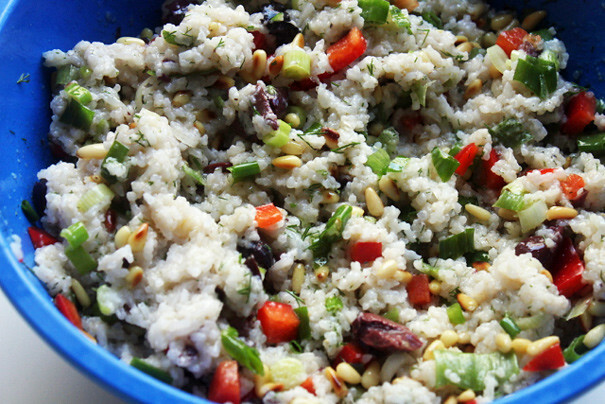 Stir that all in and you’ve got rice salad. I have a feeling, if I’d cooked the rice a little more carefully, this could’ve become a regular fixture at my dinner table or, more probably, at picnics or outdoor events. As it was, though, it had a gloppy quality that hopefully bothered me more than it did our dinner guests. This is a great base for any protein you want to serve; in this case, it was spatchcocked chicken. 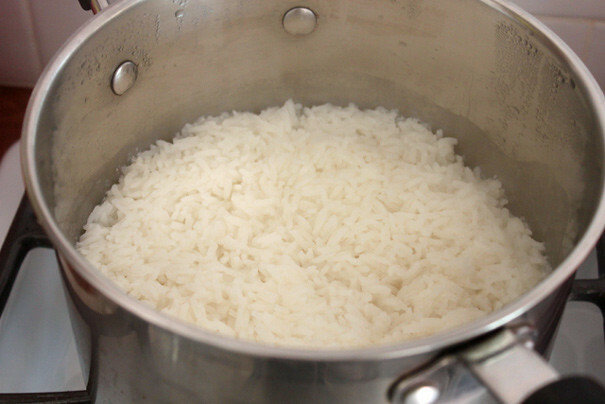 Place the rice and water in a small, heavy saucepan and bring to a boil over high heat. Stir, then reduce the heat to low, cover, and cook until the rice is tender and the water is fully absorbed, 15 to 20 minutes. Remove the pan from the heat, uncover, and let the rice cool for 20 minutes; it should still be a little warm. Transfer the rice to a large bowl. Place the oil and vinegar in a small bowl and whisk thoroughly to combine. 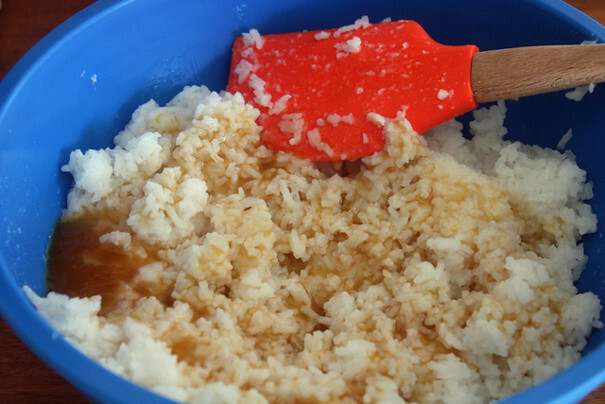 Add the dressing to the rice and toss to mix; the still-warm rice will absorb some of the dressing. 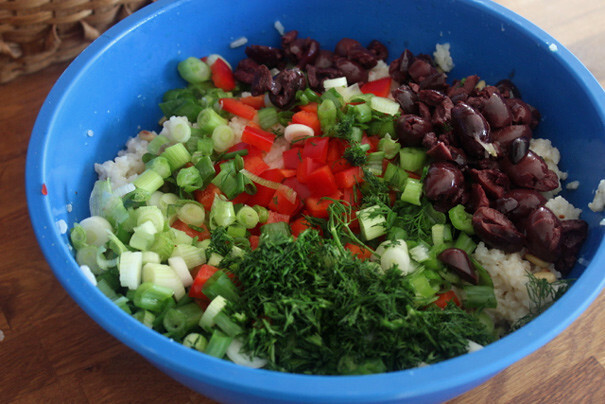 Add the pine nuts, olives, scallions, bell pepper, parsley, dill, salt, and pepper and toss well to mix. Taste and adjust the seasoning, then serve at room temperature.